It started with the ducks. The Muscovies like to hang out on top of the chicken coop or goat shed. When we converted the old storage shed into a chicken coop (long before we got the ducks), we discovered a leak so we tarped it. Tarp was the fastest, cheapest option for fixing it, and amazingly, it has lasted over five and a half years. It has recently begun to shred, however, and for some reason, the ducks love to pull at those shreds. The tarp is in tatters. Dan and I discussed putting another tarp on the shed, but if we can't keep the ducks off (which is doubtful), then the new tarp will have a short lifespan. We don't want to keep replacing tarps every year or so, so a better option would be a permanent roof, preferably metal. 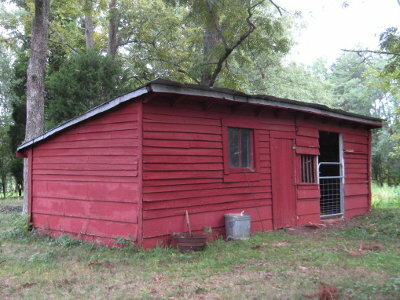 But is it worth the time and expense to roof that old outbuilding? That question set off a brand new brainstorming session. I've been talking about a goat barn for quite awhile now, and we've developed a series of plans for it, starting back in March 2013. Why have none of these come to pass? The old oak tree. Random dead branches fall to the ground periodically. It's sister tree to the one we took down two years ago. The concern is it (or some of its huge branches) falling where we planned to put the new barn. That tree was on our goal list to tend to this past summer, and Dan went so far as to price having it done. The quote to cut off all the long old branches was $1000. To rent a high-reach to do the job ourselves would have been $1000. It may as well have been $1,000,000. The need to do something about the goat shed roof pressed the issue. We still don't have the lump sum to tend to that tree, so we got to discussing if there was something we could do with what we've already got. The original building is more of a half shed. lots of photos, but I have very few photos of the shed itself. The current idea under discussion would be to simply add a second half with a new roof and new siding. The goats would get the back, I would put the milking room and feed storage in the front right, hay and straw storage would be on the left. An overhang for a goat loafing area would give the finish it off. Will it actually happen? None of the others have yet, but this one is the simplest plan so far. That translates to the most doable, and if we don't have to wait on getting those tree limbs down, I think we actually have a chance. Is that Oak too close to something to just be felled or something? Looks like it would be easy to drop cutting out the angle slice and then wedging the other side. I am not a huge fan of dropping really big trunked trees but that one doesn't look too bad. I like this idea. It could work. The question is, where would you put the chickens, and ducks? Yes, too close and too tall. Dan talked about taking the whole thing down but at best it would take out goat fencing plus hay hut or fencing plus fig trees. At worst it would take out the goat shed. We figured if the longest branches were all gone, it could be felled right where we originally wanted to put the goat barn. Still a dilemma! Temporary is great, but isn't it exciting to be looking forward to a proper building! Sounds like yours may be up for this winter! I should have mentioned that we built a new chicken coop almost two years ago in anticipation of the new goat barn! (Hard to believe we've been trying to get to the goat barn for this long). http://www.klenepipe.com This company makes nice pipe frames that can be skinned any way you choose. They have an example I will email to you that shows two sheds joined with an aisle in the middle. I like it. It's crazy how much it costs to trim or take down trees. I think it's funny the ducks go up on the roof. Do you have a metal roofing supplier near you? Where we are getting the roofing for the house they sell left over, mismatched and odd length brand new sheets for 1.00 a foot. These sheets are 3 feet wide and range in length from 3' to. 15 or 20 feet. I love your simple, workable barn plan. We found out several years ago how expensive tree trimming & removal is. I like the new barn plan. sounds like the plans that we have here... a "if you give a mouse a cookie, he'll want a glass of milk..." thing. So even though the kitchen faucet should have been replaced when we moved in 14 years ago because it has a leak, we've been putting it off, because if we replace the faucet, we should really replace the kitchen sink and while we're at the sink we might as well do the counter tops... sigh hope you get it all sorted soon. Tough situation on the tree but if you could avoid buildings, it would probably be cheaper to let it take out the fence and other trees and just repair/replant them after you get the mess cleared up. Not appealing but probably cheaper than hiring it done. I don't know about your neck of the woods but up here, tin is easy and cheap to get a hold of used. If you see an old barn or shed falling apart, generally all it takes is a knock on the door and offering a little bit of money and they are happy to let you remove the tin off. Some will even give it to you. The hardest part (after removing it) is just figuring out perlin locations so you can reuse the existing holes. Interesting website. I especially like their hay-saving feeders. But I notice you have to contact them for pricing! Yes, I'd be interested in seeing the adjoining sheds. Yes, tree trimming or felling is outrageously expensive. Thousands of $$ for several hours of work with no new outlay of materials for each job preformed. Equipment would be expensive, but basically there's no overhead except for fuel. I think we're in the wrong business! Yes, we do have metal roofers around here (who want to include installation and a mark-up on materials :o ) We've also purchased metal roofing from Lowes. There is an online DIY dealer, however, that I think has the best prices and we'll likely go with them. Website is Absolute Steel Metal Roofing Source. The guy who gave us that quote bragged about how careful he was and then proceeded to tromp through a newly planted flower bed instead of using the sidewalk right next to it! Yikes, no! Then the insurance company would likely get involved and they love any opportunity to raise rates! Dan found used tin sheets on craigslist and used them when we did our little buck barn (now the pig palace). He tarred it when he got it up, and it's the only roof we have that hasn't leaked! Taking that tree down and having it land in the right place would be a feat! Worse case there would be it hitting one of the nearby pecan trees and bouncing off in another direction. I'm not sure what we're going to do! When we got our Muscovy ducks my mom made sure to clip their wings. She was worried they might fly away or into the neighbors yard. I know that some of them have gone through molt, but haven't seen any fly. I think it is because steel prices vary so much. I really like your idea of using your existing building and adding to it. Just a quick funny story: I saw an auction near us where they were selling off everything including a huge barn, milk house, and chicken house. I asked my husband what he thought of buying the chicken house to use as a storage building, would we be able to get it moved in the allotted time etc. He humored me, asked what my bid limit would be and when I told him $75.00, he felt he was home free! Well, I won it for $30 and a gentleman came up to me and asked if when we were disassembling our building to move would we be able to take down some cupolas that he had bought and gave me $30 to do it! We just purchased some cement blocks for the foundation, and found a super deal on metal roofing...voila! It's too bad you can't put the barn on skids and move it out of the wayof the tree. Didn't you move part of a shed on skids? Around here, the arborists have ways of getting trees down when things are too crowded with wires, other trees, etc., to get a high reach in position. Not sure how you'd feel about going up there on ropes, but I'd bet 100' of even a really fancy rope is a lot less than $1000! Im not sure if these things are possible but if it is dead then could you not just burn the tree where it stands. You would have to wait for the right weather but its just an idea. When we had guinea fowl they would hop the fences and wander all over the place. We finally got rid of them because they wouldn't stay put and we didn't want to annoy the neighbors. We had similar concerns with the Muscovies, but the gal I got them from said she'd rarely seen them fly. Well, the do fly, but only to the tops of those two buildings. And they always go back to the chicken yard. They could easily fly down into one of the adjoining pasture or the back yard, but they never do. They always go back to the chicken yard. I'm not sure if that's typical, but that's our story! We had the other one done for $800, but we had the money at the time and that tree was in worse shape and closer to the house! Oh my yes, we did move part of the building - the roof of the old building we took down. No skids though, we cut the roof in half, balanced each half on a wheelbarrow, and moved it that way. Actually, now that we have the tractor, buildings on skids are doable, and something to think about. Maybe 30 years ago! For climbing ropes, I mean. Dan nixed those spiked lumberjack boots too, and I can only agree! You're right though, that there are ways to get trees down in confined areas. It would have to start with removing the long outer branches, which would be our stage one, but that's where we're hung up at the moment. Good idea, though. Oh my, what a fantastic mental image your suggestion inspires. The tree isn't dead yet, just dying. There are quite a few dead branches which regularly fall from sharp winds or from crows taking off after sitting on them. All this blog discussion has definitely got me thinking about it again. Eventually something will have to be done. Earlier this evening (but not much) I was sorting and wrapping up sweet potatoes in newsprint for storage in boxes under the table. My husband was boiling water for bee feeding. I can almost see my kitchen floor again!. I pulled my tom plants and have them hanging and ripening, the last for a good year. We have had a frost and a mild freeze and are now back to the mid-60s. Lucky me I get to make some wreaths of pine cone, grape vine, dried okra pods, corn husks etc. to sell at the last of the farmers marketing for the year. Also, I am reading your book and enjoying it much. Lynne, you sound wonderfully busy! I love the idea of the wreaths. And I hope my book encourages you! Love the pic of the Muscovies. Ours, growing up, loved to do the same thing. We had a 1950s area aluminum roofed 2 story barn and, inthe winter, they used to slide down from the peak all the way to the gutter before taking to the air and going back for another round. Loads of fun to watch as a kid! I enjoyed this post. We have had muscovy ducks (we love them) but only have one now. Our old pair died about a year ago. Most of our problems here have been with trees falling, we left way too many when we build the house. I so love your blog!